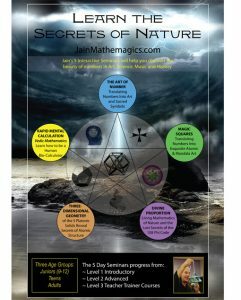 This DVD is essential to have if you choose to buy the master’s book on Vedic Mathematics, as I explain on the whiteboard everything there is needed to be known, whereas the master’s book, is so brilliant with its many short-cuts that many of them are not fully explained to the Western Mind. 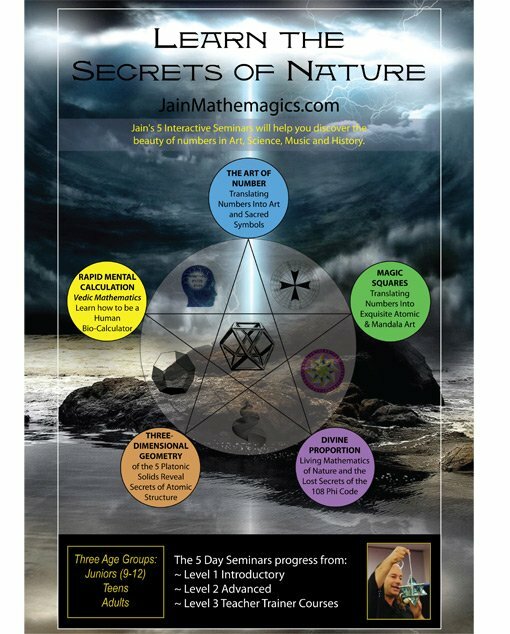 Filmed at the Cape Byron Steiner School, this DVD will give you a broad overview on how the 16 Sutras can solve every known mathematical problem. You will never multiply or divide again the way you were taught at school, once you adopt these basic principles. Learn why NASA are secretly using this system of Vedic Mathematics in the field of advanced robotics aka artificial intelligence trying to simulate how the brain really works and computes mathematical problems. 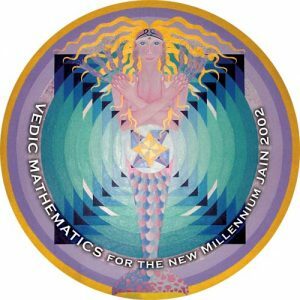 Eastern Vedic Mathematics is a superior mental, one-line system of arithmetic that will enhance the current ‘Western’ mathematics in school curriculae. Learn why you no longer need to know your Multiplication Tables of 6, 7, 8 and 9. Its brilliant. 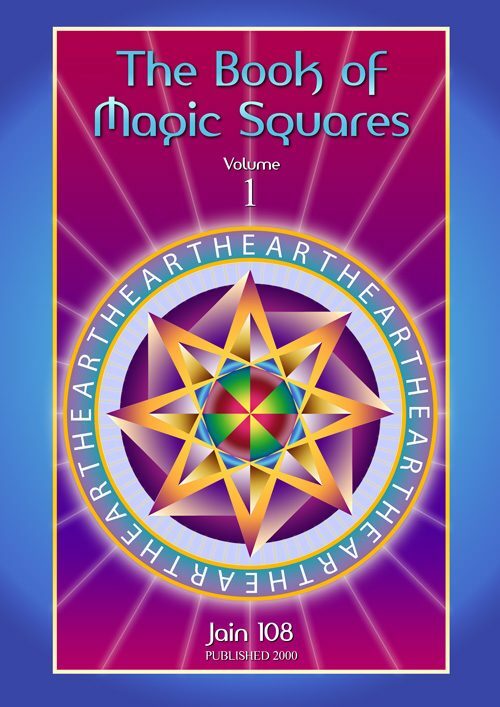 This DVD is essential to get started with Vedic MatheMagics. Of all 12 items, this DVD is the most popular of all. Most people are ordering this DVD first before they buy any of the books. I guess people are getting lazy these days and like to learn in the comfort of their lounge-room. The success of this DVD has surprised me and taught me that yes people are very visually orientated and enjoy learning from visual mediums like videoes and dvds. Note that this dvd has now become famous in that it is the first dvd in the world that deals totally with this topic of Rapid Mental Calculation also known as Vedic Mathematics. Many scholars in India are amazed that Jain 108, a westerner, (or really an Arab, as he is full blood Phoenician by descent), was the first to put this rare material out, before any Indian pundits attempts to popularize this lost knowledge. Credit goes to Kenneth Williams of the UK who first popularized the written form of the Master Bharati Krishna Tirthaji’s classic “Vedic Mathematics”. mental, one-line system of arithmetic that will enhance the current ‘Western’ mathematics in school curriculae. Learn why you no longer need to know your Multiplication Tables of 6, 7, 8 and 9. Its brilliant. The Vedic Scholars from thousands of years ago invented the concept of zero. Without ‘Zero’, Jain asserts, we would not have computers nor rockets to the moon. It was the greatest discovery for the advancement of the technological era that we are in. Currently, mathematicians have no known way of determining say the square root of 38. Jain shows how it can be effortlessly done to 6 decimal places in one line of working out. Then, unbelievably, he mentally calculates the cube root of numbers in the hundreds of thousands! Course for the serious student wishing to become a human bio-calculator. There is enough material in this 2 hour 15 minute video that it will create another 10 more dvds, being more specific regarding each of the 16 Sutras. This video is fast becoming “the early Jain”, as he has created more new material, and has changed his image somewhat to blend into the International Forum that are demanding his Teachings. 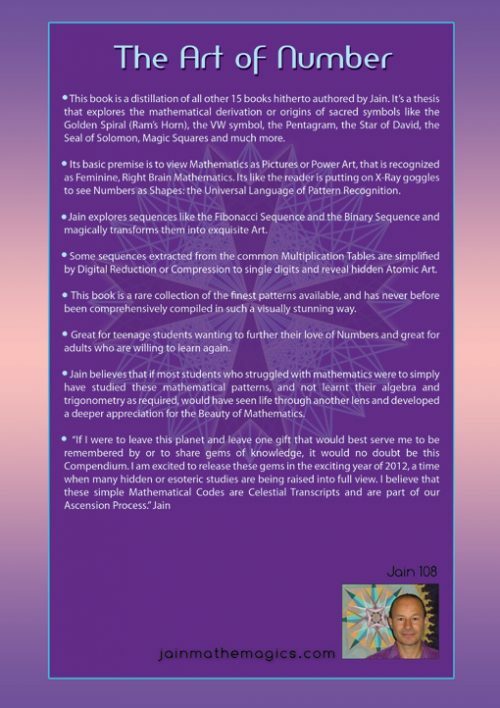 For DVD VEDIC MATHEMATICS FOR THE NEW MILLENNIUM. 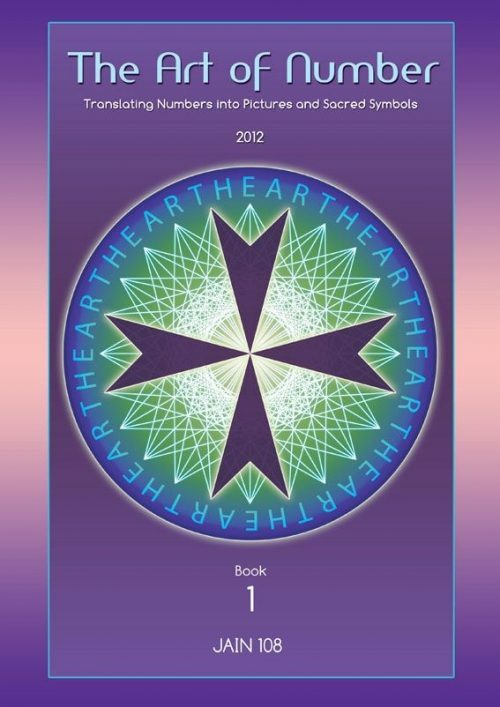 (Images of Dolphusion (Mural), Earth-Heart Logo, Hathor, Magic Square of 3 Logo, Isharni Jainasun (son) + B. K. TirthaJi). PRAYER and DEDICATION To SHANKACHARYA BHARATI KRSNA TIRTHAJI. (Imagesof Shankacharya, Saraswati, Dhanvantari, BabaJi). HINDU ORIGIN OF OUR NUMERALS DERIVED FROM ANGLES. (Angles Of The Angels). (Image of Shiva). SUTRA 1: BY ONE MORE THAN THE PREVIOUS DIGIT. (Images of two pages of Sanskrit Sutras). PATTERNS IN THE SEQUENCE OF ODD NUMBERS. THE PYRAMID OF THE NATURAL COUNTING NUMBERS. MULTIPLICATION BY NINE USING FINGERS. SUTRA 3: TRANSPOSE AND APPLY. HOW THE SONIC KNOWLEDGE OF PI WAS SUNG. SUTRA 4: DIGITAL SUMS. MULTIPLICATION BY ELEVEN. MULTIPLICATION BY ELEVEN, TWELVE AND THIRTEEN. 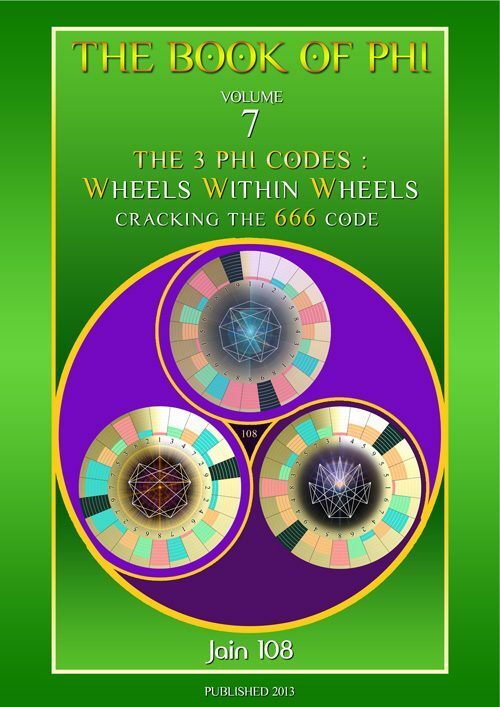 (The Mathematics of Engineering and Temple Building). SUTRA 6: VERTICALLY AND CROSSWISE. (Images of Brain’s Optic Nerve Cross-Over + Magnetic Fields). and SUTRA 8: BY THE SURPLUS. (ALL FROM NINE AND THE LAST FROM TEN). (‘On The Flag’ or `To Hoist Up’). (Image of Shakuntala Devi, Mathematical Genius). (Utilizing the Sutra: Vertically and Crosswise). (Image of Maharishi Mahesh Yogi). CREDITS & BOOKS BY JAIN. Contact Details. (Image of Saint ‘Mar Charbel’, Lebanese Monk from 70 years ago, one of my Spiritual Guides).